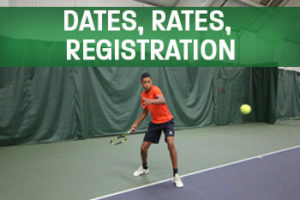 Whether your child is a beginner or a competitive player, The Junior Tennis Academy’s Summer Camp will have them excited to be playing this lifelong sport! 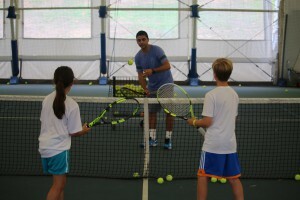 Our Tennis Professionals give each camper personal attention and age-appropriate instruction ranging from basic skills to match play strategy. 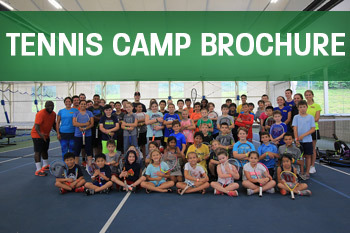 Balanced with the right amount of off-court activities, free time, swim, and match play, your camper will keep progressing without the worry of tennis overload! The tennis facility at DHAC includes six indoor courts, four outdoor courts with permanent roof structure. Your camper will enjoy the summer outdoor weather while being protected from the sun and rain. Multiple indoor fitness and recreation areas are utilized for “off court activity”. The Summer Club Water Park is available to campers during their swim/free time. Two large water slides, wave pool, water obstacle course, bumper boats, splash pad and tons more water all are vigilantly life guarded by the Ellis and Associates, licensed lifeguards of The Summer Club. Enroll in advance for extended hours.